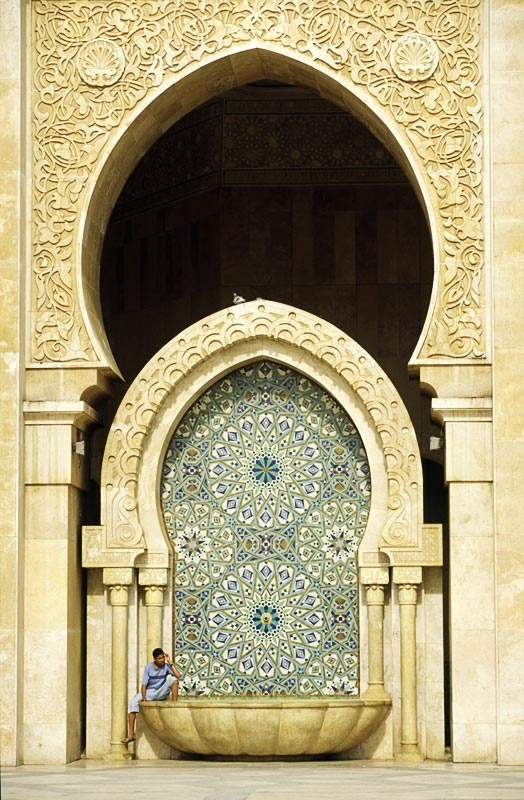 The Hassan II Mosque or Grand Mosquée Hassan II is a mosque in Casablanca, Morocco. It is the largest mosque in the country and the 7th largest in the world. Its minaret is the world's tallest at 210 metres (689 ft). Completed in 1993, it was designed by Michel Pinseau and built by Bouygues. The minaret is 60 stories high topped by a laser, the light from which is directed towards Mecca. The mosque stands on a promontory looking out to the Atlantic Ocean, the sea bed being visible through the glass floor of the building's hall. The walls are of hand-crafted marble and the roof is retractable. A maximum of 105,000 worshippers can gather together for prayer: 25,000 inside the mosque hall and another 80,000 on the mosque's outside grounds.